SAN JOSE — Comeback wins are becoming business as usual for the Ottawa Senators. 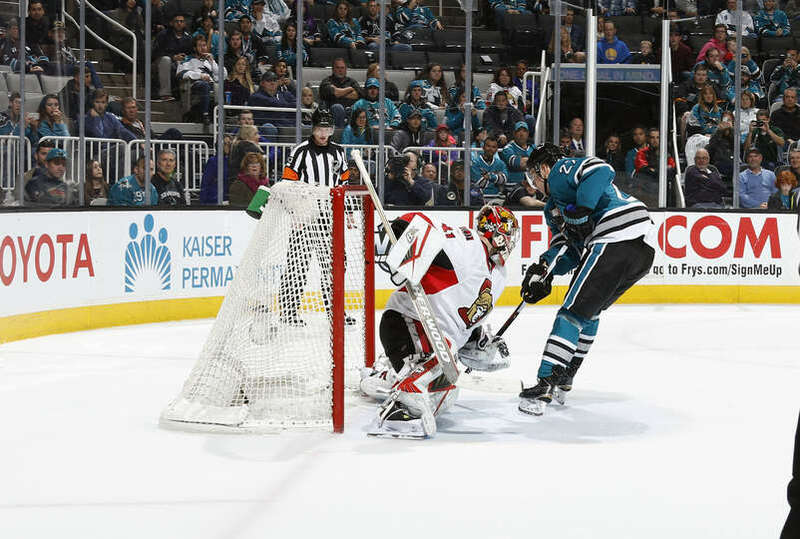 Zack Smith scored a game-tying goal on a penalty shot with 5:31 left in the third period and Mika Zibanejad scored the only goal in the shootout to help the Ottawa Senators to a 4-3 win against the San Jose Sharks at SAP Center on Monday. Max McCormick and Bobby Ryan scored in regulation for Ottawa (22-18-6). Craig Anderson finished with 32 saves. The Senators overcame a 3-1 third-period deficit to defeat the Los Angeles Kings 5-3 on Saturday at Staples Center. After roaring back again Monday, they’re 2-2-0 on their five game road trip, which concludes Thursday against the New Jersey Devils. After Ottawa killed off a Sharks power play in overtime, Anderson stopped all three shots he faced in the shootout, denying Joe Pavelski, Joonas Donskoi and Logan Couture. Zibanejad scored in the third round, beating Sharks goalie Alex Stalock stick side. Stalock made 14 saves for San Jose (23-18-3), which saw its five-game winning streak end. Tomas Hertl, Couture and Matt Nieto scored in regulation for the Sharks. The Senators took a 2-1 lead into the third period, but San Jose pulled even at 2:47 on a goal by Couture. His wrist shot from the right circle struck Anderson in the mask, then ricocheted to the ice and trickled over the goal line. Nieto gave San Jose a 3-2 lead at 7:54, taking a cross-ice feed from Donskoi and beating Anderson with a backhand from close range. Ottawa responded at 14:29 when Smith scored on a penalty shot after defenseman Brent Burns tripped him on a shorthanded breakaway. Smith came almost to a complete stop in front of the crease and lifted the puck into the upper left corner to Stalock’s stick side. After a video review, the referee’s call that the puck was still in motion toward the goal line when Smith shot was confirmed. “When I drew the penalty, I went hard to the net and I was a little tired,” Smith said. “I was just bearing down trying to rack my brain to think of one move I could do on that ice. The ice was pretty slow. I didn’t feel like deking was in my repertoire. The Sharks outshot Ottawa 11-5 in the first period, but McCormick scored the only goal, giving the Senators a 1-0 lead at 11:12. McCormick took a long cross-ice stretch pass from Cody Ceci that bounced off the left boards. He chased down the puck and instead of staying in the crease, an aggressive Stalock bolted far into the left circle and tried to make a poke check, but McCormick got to the puck first and beat Stalock five-hole. Ryan extended Ottawa’s lead to 2-0 at 4:08 of the second period with a power-play goal. With Joel Ward in the penalty box for tripping, Ryan’s shot from the right circle deflected off of Burns’ stick and past Stalock inside the right post. The goal was Ryan’s 15th of the season. Hertl answered with a goal eight seconds later, cutting Ottawa’s lead to 2-1. Pavelski won the faceoff at center ice, and Burns quickly moved the puck into Ottawa’s end and fed Joe Thornton above the right circle. Thornton sent the puck towards the net, where Hertl redirected it in front past Anderson. Thornton had his 927th career assist, breaking a tie with Stan Mikita and moving into sole possession of 17th place on the NHL’s all-time list. Senators forward Mike Hoffman was injured at 5:40 of the second period during a collision in the crease with Stalock and did not return to the game. Hoffman crashed into the left post with his right shoulder, knocking his helmet off and the net loose. Cameron did not have an update on Hoffman’s injury. Without Hoffman, the Senators were forced to play shorthanded and shuffle their lines. Smith went from third-line center to top-line wing, filling in for Hoffman. Senators defenseman Marc Methot was a late scratch because of a lower-body injury. He was replaced by Chris Wideman.